The following is a structure you can follow for your (2000 word) Engagement Activity (EA) in IB Global Politics. It will help you tick all the boxes, doing what will be rewarded, so you’ll get a better mark. Having a clear structure like this will also save you time and help you write more clearly. 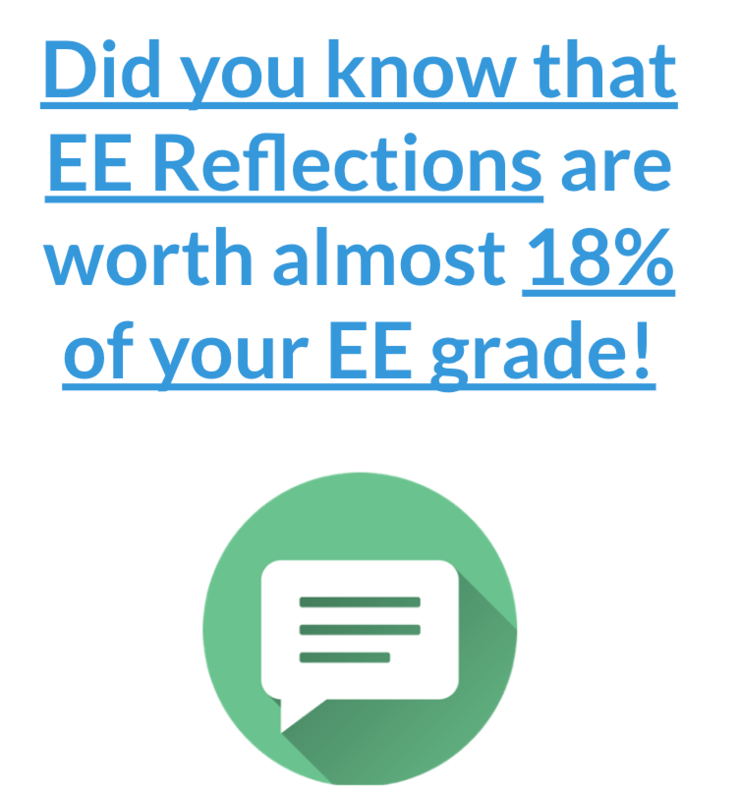 A common mistake is thinking that your EA marks will basically come mostly from showing off your understanding of course theories. But, the EA is not so focused on theories. Theories are just a part of where you're getting your marks. 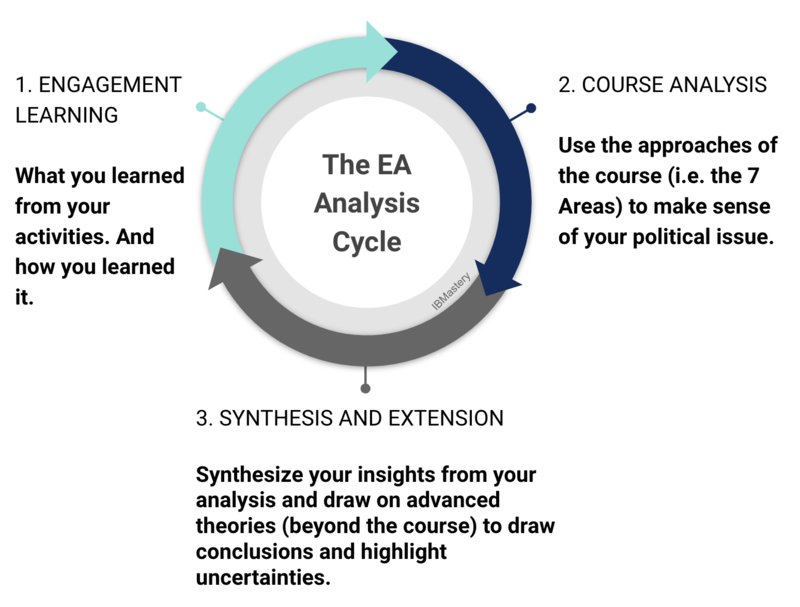 The main purpose of the EA is to get you out in the world, involved with a real political challenge, so you can learn how to actually effect change. It’s about taking potentially-influential actions (i.e. interviewing someone, organizing an event) and then seeing how it goes and learning from your experience -- using research, course theories (and the other 6 areas of the course). But you will also get some marks just from reflecting on what seemed to work well and why. The title, written in the form of a question. The political issue. (Note that this is different from the title). In this section you need to help us understand what your political issue is and why it is important. Explain the context of your political situation. What is going on in general, but don’t spend too many words on that. Clearly state the political issue you are exploring (see Political Issues in Global Politics for help). Write your issue in the form of a question. Explain why the issue is important to you personally. Perhaps you had a certain experience which led you to appreciate how crucial it is for change to occur around this specific problem. (Feel free to use the word “I” here. We want to understand your own unique link to this cause). We want to believe that you authentically care about this thing. Make clear a few links between your engagement activity and the key concepts of the course (think of the unit/chapter titles and the GP vocabulary). 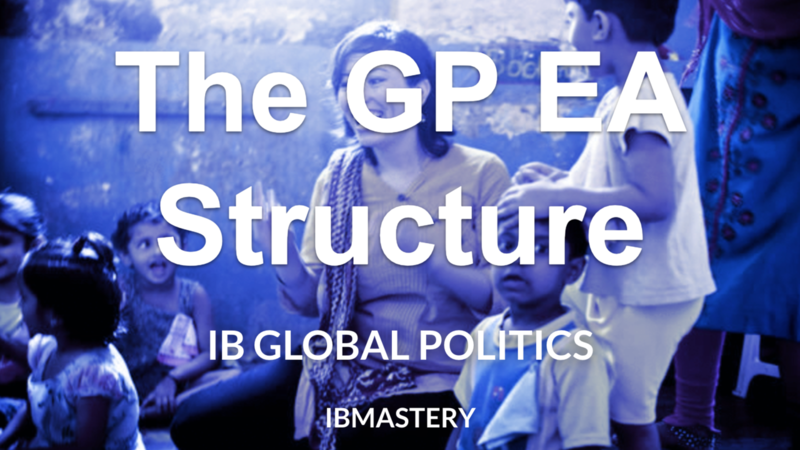 Identify one or two levels of analysis you’ll be using to explore the political issue (There is some help on how to explore the Levels of Analysis in the Global Politics Mastery course online). This section is similar to your methodology section in your EE. However, here your 'method' is about how you engaged with your political issue. Help us understand what engagement activities you organized, how they went and (most importantly) what you learned from them. Ideally you’ll take on a variety of activities that give you a balanced understanding from multiple perspectives. Again really take note that you’re getting a lot of marks from THE LEARNING from the activities. A good activity is one that you learn a lot from. First give us a quick overview of the 2-4 engagement activities that you did. Variety here is good. Explain what you learned from each activity and how that informed your thinking and your subsequent activities. 1- Why you chose that activity (i.e. why you chose to interview person X). Briefly linking your learning to some of the 7 areas of the course. (You’ll do more of this, in more depth, later on). Looking at it from different perspectives. For example, talk with different stakeholders about what happened and why, so you can understand things from their perspective. Linking your activity back to your political issue and reflecting on what is required for progress. Establish without a doubt that you engaged in a few different activities and that you learned interesting things each time. We want to see you being reflective and using the approaches of the course to improve over time. Show us that you were authentically involved. You actually took a lead role (i.e. organizing the event, or setting up the interview). In this section you’ll show how the 7 course areas (including course theories) and additional research are useful to help us understand several aspects of your engagements. You have 2 main options here, for organization your main body. The first is going through your engagements chronologically. The second is exploring 3 or 4 themes (or interesting aspects) that came up in your engagements as a whole. For example, you could have one development on contextual aspects that make change difficult, another on government aspects, and the final one on Non-Profit involvement. The themes that make sense for you will emerge as you do your engagement activities and reflect on them. Also, it is extremely important that your analysis here is very deeply linked to the engagements. We want to see that you are choosing to analyze things here BECAUSE they arose as interesting questions for you during your EA activities. You are using course approaches to explore relevant topics that emerged as you did your activities. Use this part of your EA to dig quite deep into a few interesting aspects related to your political issue. Here is a useful way to think about your writing here. Do this at least 3 times. Include more than one form of research (for example, into the wider political context of the activity and the issue. Include more than on theoretical perspective. Clearly be linked to your engagement activity experiences. Have claims and counterclaims, each supported by evidence. End with a mini-conclusion (synthesizing the insights in the development, and concluding in an insightful way). In this section you aren’t going to include any new information. Instead you should synthesize the insights from your Body Section 1 and Body Section 2, in interesting ways. For example, you might share a pattern that you’ve noticed, but then an exception to that pattern. Tie together the insights that you had from your personal experiences (the Engagement activities), your 7 Areas analysis and your other research. Take your mini-conclusions from synthesis to a higher level. Explain the major insights that seem to be true, based on your experiences and your research. Explain some limitations of your EA work. For example, maybe now you realize ways that you could have done some of your engagements differently. We will reward you for noticing this yourself. Provide an explanation of what your engagement taught you about the nature of global politics and your political issue specifically. Give us the overall impression that you really understanding global politics better, as a result of your activities, and in particular why it can be difficult to effect change. Make sure you have referenced all interviews, books, articles and other sources you’ve used in your EA. Include at least 8 sources (my suggestion). I would also suggest you include at least 1 interview, 1 book and one very academic source. Here are some more tips on doing advanced research. "Thanks a ton! I have used this article to guide me for my last 2 IA's and when I was assigned my 3rd and final Econ IA, the first thing I did once I got my Econ article, was open this page. Much appreciation from Pearson College UWC! "I actually just wanted to let you know that you have been a very big help for me in TOK and Economics. With your effort to publish all this information and advice to IB students, you're really making a difference!" "Me and my partner have got an A for our presentation, fully following this guide. Thank you so much Mr. Woods!" "Thank you so much for this structure! We followed it exactly as you laid out in our TOK presentation and our teacher gave us 9/10!!" "I want to thank you for the resources that have been provided. As a result, I got an A for EE in business after following the steps written in this website, including the help from my supervisor of course. I would recommend the current IB students to read the resources in your web, in order to obtain more insights. Thank you once again, sir!" "I'm an IB student who has been lost until I found this website! This has the best advice on the web and I'm definitely recommending it to all my fellow IBers back at school. Definitely wish you were my economics teacher! Thank you so much for taking time to write these guides. You have truly saved my IB life!" "WOW! Thank you already for helping me. So many great posts about IB and how to be effective. So awesome. I will defiantly spend more time here and hopefully learn a lot. I just wanted to let you know how great and helpful your website is :)"
"Thank you so much Mr Woods. The Economics exam will start in 4 hours and I think I am ready for it!" "Your website is amazing! I got two level 7's in my last IAs with the help of your site. Thank you, all the way from UWCSA"
"@adnamaweit Every self-motivated IB student knows @timwoods..."
"Just want to express my deepest gratitude and appreciation for this website and all the effort you've channelled into helping others with your knowledge and skills. I've found it extremely helpful and I cannot thank you enough!" "Just wanted to send you a note of appreciation for the great and selfless contribution you have made. You must have already made a difference to so many lives and achieved the real purpose of our lives. " "Thank you so much Mr. Woods. I find it absolutely incredible that you take the time to answer students and write your posts. Just today I was talking with another friend of mine who, I just found out, also happens to be following your blog." "Dear Mr. Woods, thank you so much for your structure for TOK essays. It's really helped me develop a clear idea of what to do when I was absolutely clueless before! Definitely recommending to all my peers." "This page is awesome. Thank you very much for your help in my IA. You saved my life. Argentina wishes the best for you. Gracias!" "Thank you for this piece of gold! I was about to give up on my TOK presentation when I saw this page! Now I know I can deal with the IB and TOK in particular! Greetings from PERU!" "Thank you so much for all of this voluntary support. I'm taking an online economics HL course and it becomes quite difficult at times to find assistance. You're a life saver!." "Hello, I just wanted to say thank you for writing these guides. They have been extremely helpful for me, I was just about to panic and give up on my IA and now I am actually really proud of it." "Dear Mr. Woods, your initiative is highly appreciated and needless to say, the resources on this website are helping thousands of students tremendously. As for me, I thank you sincerely for your notes on IB Economics, the Extended Essay and for Theory of Knowledge. Hats off! Nothing better than spreading wisdom! Congratulations!" "Everyone at my school in Mexico uses your Structure for TOK essays. I've used it on all of mine and I've never gotten lower than an A-. I just wanted to thank you for being a lifesaver." "How to structure an Economics Internal Assessment is amazing. Absolutely great. It is such a great help to have word counts of different sections and a detailed description on how to score high marks. Thank you so much." "Just wanted to say, as a fellow Economics & Business teacher of IB, I love your site. So plain, simple but so effective. My students in Barcelona love it too and it makes my job easier. Keep up the good work, and thank you once again. Really good and inspirational information on your site!" "Thank you! This is tremendously helpful. I am writing three IAs tonight. Unsure as to what I would do without these posts these posts as a guide. Thanks again." "I am an IB student from India and I am very very thankful to you for these sites. My extended essay, TOK essay and business IA are the result of your articles and ideas. Your site gave my extended essay a plan on how to go about it and made the journey simpler. The article how to score full marks in the business IA was really helpful as it gave me a plan and coming into TOK I was able to build my ideas in structured pattern. "I was looking about to get some support material for my son’s TOK and EE today and your pages have been great. They are easy to follow and digest. My son was very grateful. Your blog has been a fabulous resource! Keep up the great work!" "Just wanted to write you a quick thank you note for putting up such a great revision website! It is honestly one of the best I have encountered online for IB Economics revision. If I was at OFS it would be a pleasure to have you as my Econs teacher!" "Your Economics IA slideshow really helped me understand what assessors were looking for, and how I could easily avoid loosing marks (word count etc). I really appreciate the time that you have spent to help students like me." "woooooooooooooow How to Write Successful College Application Essays has opened my eyes like so wide. thanx tim woods i sure will apply all these tips"
© 2019 IBMastery. Not affiliated with or endorsed by the International Baccalaureate Organization.